Vue.js is lightweight and easily adoptable. It’s reactive and component-based, allowing you to create pluggable components you can add to any project. Most importantly for this tutorial, Vue and its hallmark incremental adoptability allows you to try Vue without putting your existing code base at risk. Vue works well with serverless application architectures. Serverless architectures are becoming the preferred architecture for many developers because it allows them to create and fine-tune products efficiently without having to bear the burdens (server maintenance, outages, and scaling bottlenecks) of traditional server-based architecture. Sarah Drasner recently wrote an entire series on how to create a serverless checkout flow powered by Vue and is a good example of this in practice. 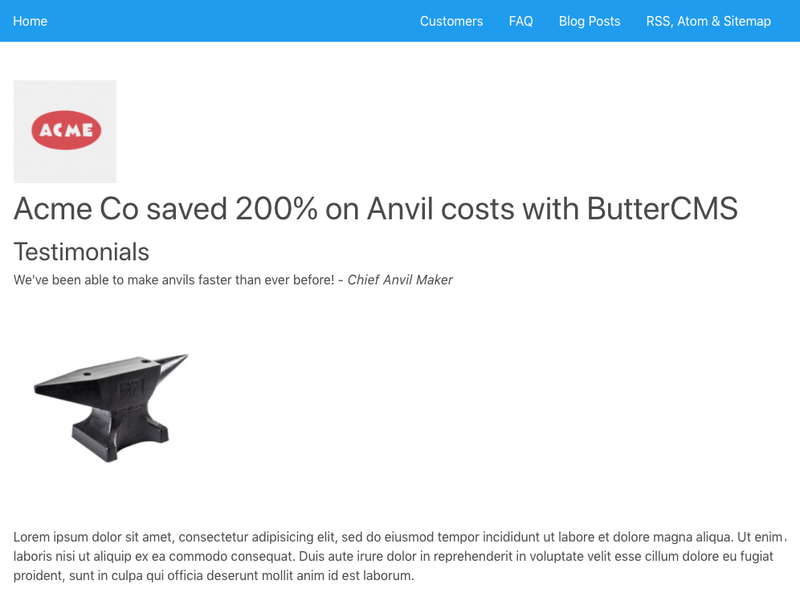 In this tutorial, you’ll learn how to build a marketing website as a serverless Vue.js application using ButterCMS. 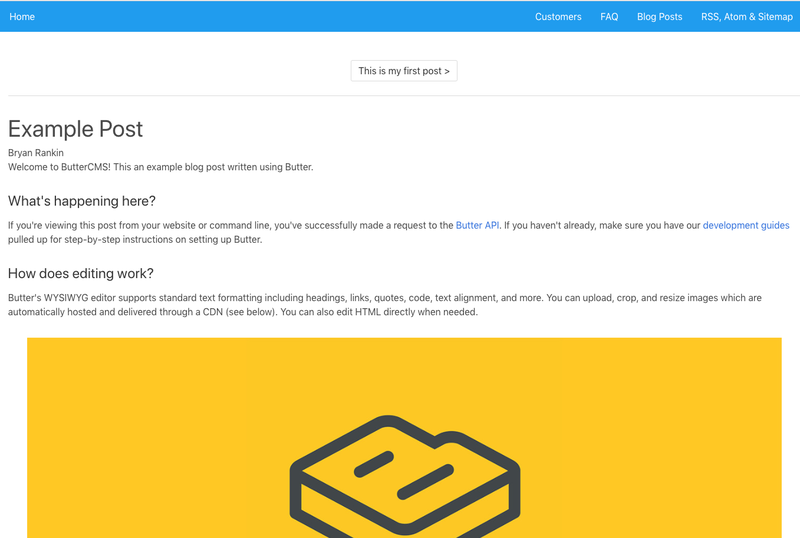 ButterCMS is a headless CMS and blogging platform that lets you build CMS-powered apps using any programming language, including Vue. There are other options for going with a headless CMS, but I happen to develop for ButterCMS and know it extremely well so that's what we'll be using in our examples. This tutorial will show you how to add performant content APIs to your Vue.js application. These APIs are easy to navigate even for the non-technical members of your team, enabling you to enjoy agile content management without having to spin up and maintain your own CMS infrastructure. Specifically, we’ll examine code samples for three content types we might find on a marketing website: customer case studies, frequently asked questions, and blog posts. Note that the designs in the screenshots we use throughout this post will likely differ from what you build and are styled with light CSS for demonstration. Your real design would use the global styling from your app making the pages look consistent with the rest of your site. Once installed, you can proceed with the following examples. Let's start by making it possible for any non-technical person on your team to add customer case studies to the site. In this case, we'll create a page that can hold all of the published case studies that promote the product or service we're selling which, when clicked, open up the page for that case study. Using the dashboard on ButterCMS, you can create a "page type" entitled "Customer Case Study” and define the content fields. Once you’ve done this, you can create your first page. Specify the name and URL of the page using the ButterCMS dashboard and complete the populate the content fields we just defined. Next, open your code editor and create a file called buttercms.js in your /src directory. It's worth checking out Hassan Djirdeh's recent post "Let's Build a Custom Vue Router" for a deep-dive on using Vue's routing library and methods for creating custom routes. You have content in a data file, which is great, but now you need a page that uses the content. You're going to define a getpages() method that fetches all of the case study pages so you can render them together on a single landing page to create an index of them all. This will be a "homepage" for all of the published case studies. Success! Now you can go directly to a page that lists all published case studies and click on any of them to be taken to the detail page for a specific case study post. Now lets's walk through how to create a Frequently Asked Questions (FAQ) page for the app. We’ll be using ButterCMS "Content Fields” for this. Content fields are simply global pieces of content that can be managed by your team. This content can span multiple pages and each content field has a unique ID for querying, as you’ll see below. First, you’ll need to set up some custom content fields. Using the dashboard, you can set up a workspace to organize content fields. Workspaces will allow content editors to curate content without affecting development or the API. Once you're in a workspace, click the button to create a new content field. Choose the "Object" type and use "FAQ Headline" as the name of the field. It will have an API slug of faq_headline. After saving, add another field but this time choose the "Collection" type and use "FAQ Items" as the name of the field. This one will have an faq_items API slug. On the next screen, set up two properties for items in the collection and go back to your workspace to update your heading and add some FAQ posts. Notice that we predefined page_title as FAQ and then updated it with the API call to the FAQ content fields. Now anyone on your team can update the values from the ButterCMS dashboard and the corresponding content in your app will automatically update. Last, we’ll tackle a blog engine for the app. We’ll start out by creating a blog route using vue-router. To display posts we create a simple /blog route in our app and fetch blog posts, as well as a /blog/:slug route to handle individual posts. At this point, your app is pulling all blog posts, allowing you to navigate to individual posts. But, you will notice the next/previous buttons in the browser aren’t working. Why? When using routes with params, the same component instance will be reused when the user navigates from /blog/foo to /blog/bar. Since both routes render the same component, this is more efficient than destroying the old instance and creating a new one. But, this also means that the lifecycle hooks of the component will not be called. 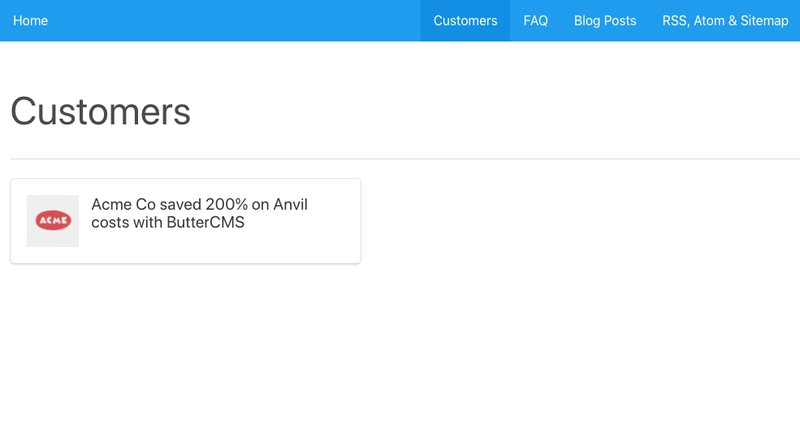 At this point, your app has a working blog that can be updated easily from the CMS dashboard. You can also use APIs to filter and feature content on your blog with categories, tags, and authors. In fact, there’s a lot you can do with an API in terms of managing different aspects of your blog, including RSS, Atom feeds, sitemap markup, and content styling with CSS. Congrats! You’ve built a serverless Vue.js application with performant content API and are now equipped with real-life use cases for content you might expect to see on any given marketing site. Your development team can get back to coding and non-technical members of your team can have an easy way to manage content without any hand-holding through the code base. And, best yet, this your app is powered by dynamic content that will can be adapted, re-purposed and scaled for future needs. Doesn’t the butter CMS have to have a node server behind it? Wouldn’t that mean its running on a server? Or is it just the fact that the traffic hitting the front end doesn’t need to talk to the backend that makes this good? Great question – ButterCMS is a 3rd party service that provides a content API. Butter is not something you download and install / maintain yourself. You simply query that content API directly from your Vue.js app, there’s no CMS software for you to worry about or host. Hence “Serverless” CMS, as in you don’t need to worry about a server to get CMS capability. What about links in the content of blog post linking to another page – would this app be able to route those? Yeah, assuming the page has a unique absolute URL, linking should work fine.